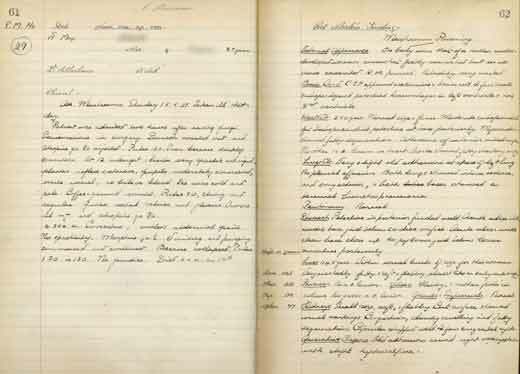 This is the original post mortem report for one of three subjects who died in the same tragic incident where poisonous mushrooms were eaten by a Cape Town family. 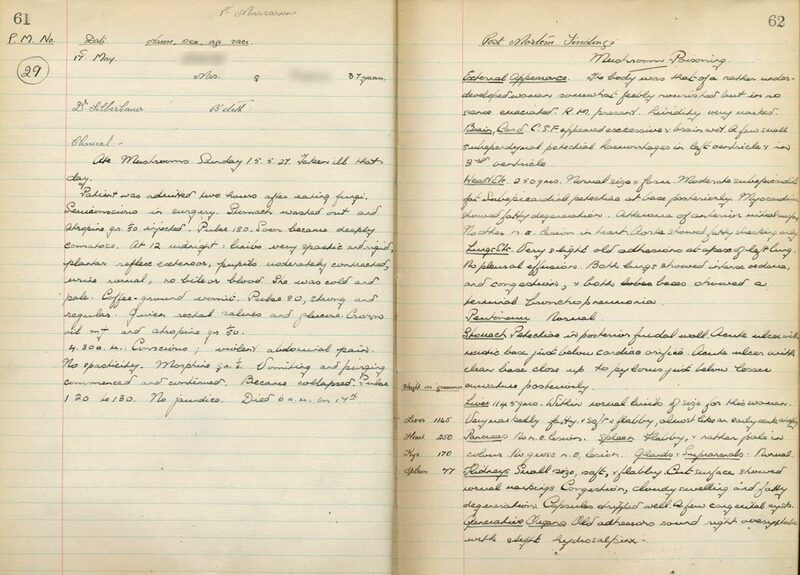 Unfortunately no notes were made about the type of mushroom(s) or where they were collected. 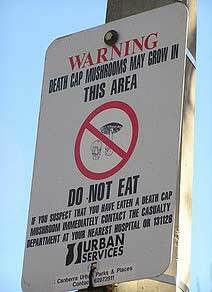 Worldwide, the majority of mushroom poisoning deaths are due to Amanita phalloides or the "death cap". These mushrooms are associated with oaks, poplars and pines and occur in Cape plantations such as Tokai and Cecilia; the spores were probably imported to South Africa along with the original exotic plant material. They can be confused with some of the edible mushrooms, and are apparently delicious. 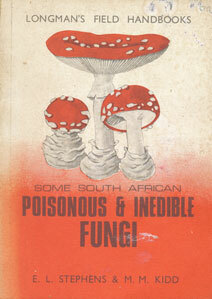 A further five cases (with 4 deaths) of presumed A. phalloides poisoning in the Eastern Cape were reported in 1988. In Amanita poisoning the onset of symptoms is 6 hours or later after ingestion (usually 10 - 14h). There is a sudden onset of nausea and vomiting, colicky abdominal pain and profuse watery diarrhoea, which may lead to dehydration, hypotension, tachycardia, hypoglycaemia and electrolyte disturbances. There is a seeming reprieve (false recovery) when these symptoms resolve, only to be followed a day or two later by signs of fulminant liver failure (jaundice, delirium, seizures, coma. Renal failure and coagulopathy are complicating factors leading to death after 6 or more days. Biomarkers of hepatocellular necrosis (AST/ALT, ALP, LDH) rise rapidly from about 36 hours after ingestion. The liver typically shows fatty degeneration with central zone necrosis and centrilobular haemorrhage. This specimen is from a family member who died 5 days after consuming the mushrooms. 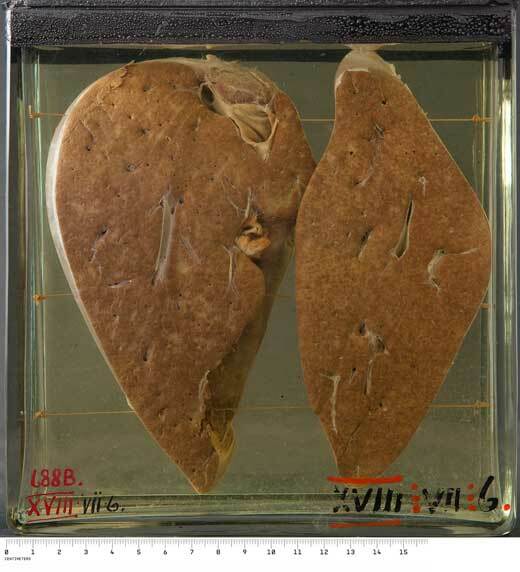 The liver shows a mottled appearance. On microscopy there was extensive central zonal necrosis, with only a narrow rim of surviving parenchymal cells around the portal tracts. 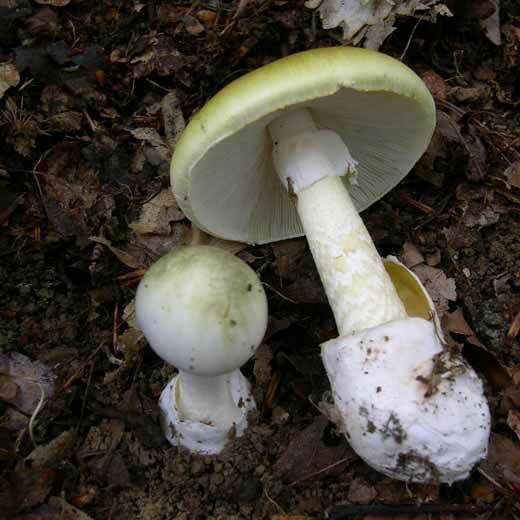 Approximately half a cap (30g) of this mushroom species can kill an adult human. They contain a group of toxins called amatoxins, of which α amanitin and β amanitin are most important. These toxins inhibit the enzyme RNA polymerase II, without which cellular mRNA and proteins cannot be synthesised. Without protein synthesis cells quickly die; the liver and kidneys are most rapidly affected. For Amanita poisoning the treatment is largely supportive (intensive care), and intravenous silibinin, derived from milk thistle, is beneficial. Note that treatment of mushroom poisoning depends on the offending fungus, so an attempt should be made to identify it. Some patients will require liver transplantation if they are to survive.